Mena’s Palace Restaurant has been serving New Orleans cuisine to locals since the 1950s. 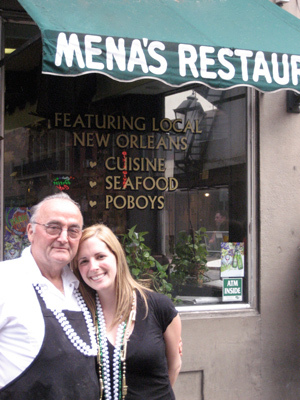 Located at the corner of Iberville and Chartres, Chef Leo Christakis purchased Mena’s Palace in 1976 and has made it the locals’ French Quarter eatery that we all know and love today. Quality & Southern hospitality. They’re conveniently located 4 blocks from Ritz & Marriott off Iberville. We got there early before they were even open at 6:30 & the friendly host was kind enough to let us in early so we can have coffee instead of standing out in the cold. There were 9 of us & everyone loved their food. I noticed everything was made from scratch & you can definitely taste the quality. I will definitely go back next time. Anytime I stay in the Quarter, I have breakfast here. It is cheap and as good as you can get anywhere. I highly recommend this place for breakfast and they have awesome staff. The food is straight forward as is the service. They serve fast and simple.